Peel Off--These are generally gel-based and draw out impurities in the skin. Freeman makes a classic Cucumber one that is inexpensive and adored by many. Note: these are different from chemical peels. Clay--Oily skin will love most clay masks (there are around a dozen different types of clay). I suggest to not let it set longer than 15 min. as there is no need to wait until the masque cracks. Queen Helene's famous Mint Julep masque is an affordable one that's been around for over 60 years. These are sometimes referred to as "mud masks." Creams and Gels--Usually for providing hydration, these masks are very thick and must be rinsed away. First Aid Beauty has a 10 Minute Fix that works miracles. Sheet--Also known as a paper mask (and great for freaking out kids and/or animals) these come with the liquid treatment built right in. I have found most of these to be pricey--I love this Le Mieux one--but Target has a decent option. 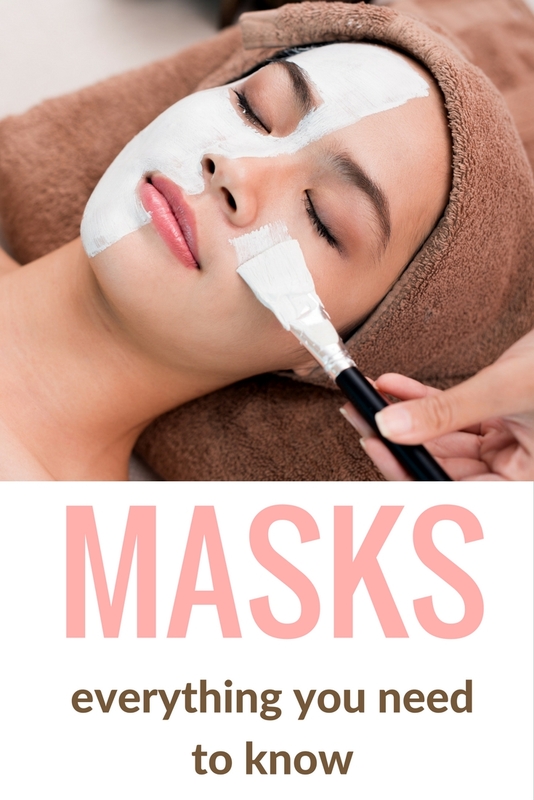 You can buy these dry and then make your own treatments to soak in the mask--see here. These can be made with various softer fibers, resembling cloth, or a sturdier mask. Most are not reusable. Charcoal--This is a "newer" type of ingredient used, and it is for helping with oily skin. DIY--You know it wouldn't be a mask post if I didn't mention my DIY recipes--I've got hundreds of them! But the best diy mask that really works is just plain Greek yogurt. It's nice for sunburns too. Leave it on for 20 minutes and rinse away. These vary from moisturizing, helping with acne, drawing out impurities, controlling oil, sun damage (dark spots), brightening, anti-aging, you name it, and there is probably a mask for it. Either is fine--I've found more people Google "masks" than "masques" and I use both terms on the blog. "Masque" just sounds fancier, right? We've all seen it: a pic of the cliche example of someone with a green mask. Sure, it looks funny, but chances are that mask is a clay one, and isn't the best choice for every skin type. Check the type of mask to make sure it could work for you. Also, check the ingredients. It might have cute packaging, but look out for ingredients that can break you out or cause irritation. Or maybe there are chemicals that you aren't into. Do a patch test first, especially if you have sensitive skin. Don't forget a masque is not a scrub. Some, like self-heating masks might require you to activate with water. Start with clean, dry skin first. Follow the instructions. Some masks show instant results, and others will need to be used more often. Also, some require additional steps. For example, maybe your rinse-away mask needs to be followed up with a moisturizer. Or maybe once you remove the sheet mask you don't need to wash your face. Try multi-masking! There's no need to use a mask all over your face, especially if you have combo skin. If possible, apply the mask to the area(s) that need it. You'll lessen your chances of a breakout or irritation. Example: I have dry skin, but my nose can get oily and I have areas of deep pores. I can use a clay masque on the areas that need it. The same goes for dry patches that need moisture. Don't forget masks for hair, feet, neck, hands, and décolletage can be purchased or made as well! What are your favorite masks? Or masques? You always have such informative posts, Elle:) I must admit I haven't used masques in ages, and methinks it's about time to use one again. You are a wealth of information as always! This was so informative! My mom always had the cucumber peel off masks when we were kids, and they would freak us out. I try it with my kids, too...they love it! I used to regularly use a charcoal mask but haven't in a while....I really think I need to get back into that routine. I noticed it definitely did help my oily skin. I need to use them more often, I try once a week but forget sometimes! I really want to try out more face masks. I'm so stuck on the Lush mask of magnaminty though haha! I've heard great stuff about those Freeman's peel off ones, and I would love to try a charcoal one, I had a charcoal face scrub and it was so nice! I love using a mask, it always feels so good and it relaxes me! Great informative post as always, Elle! I am intrigued by car coal mask, never tried it before cause the idea of having charcoal on my face kinda eeekk me out. LOL! Using a mask always feels great! I do one twice a week. I used to do at-home beauty treatments regularly, but I haven't done a masque (I agree, much fancier that way!) in a while. I need to treat my skin to one soon! My favorite type of masks is definitely clay masks. However I have all of the above besides DIY ones. I actually own the mint julep and the cucumber peel off mask. Both work really well. Which reminds me i need to do a mask treatment soon! I haven't used a face mask in a long time. I like the peel off kind. I think I'll try some Greek yogurt tonight. I rarely do masks. I should do it more often. I am definitely doing patch tests going forward! I received some beautiful sheet masks for review (all natural/organic/herbal). Popped it on before bed, face felt so soft, went to sleep, all good. The next day was a crisis. It tore up my face, including blistering some areas. A lesson learned. This is a great post! I do love my Queen Helene!!! Clay are my favorite. I do love the smell of the Freeman cucumber peel off one but it hurts to peel it off! Elle, you are a treasure. Thanks for the great info.